Considered one of the foremost experts in pet healthcare, Dr. Dodds focuses on vaccination protocols, thyroid issues and nutrition. 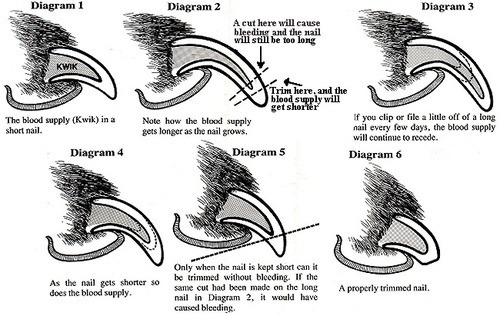 This is a wonderful guide as to how to trim your pet’s nails and keep them trimmed. If you do inadvertently cut into the kwik, Dr. Dodds’ colleague, Dr. Barbara Royal, has a great home remedy: Nail bleeding after a trim or being broken? Don’t have quick-stop powder? Apply cornstarch, soap shavings, tea bag, cotton gauze, and apply pressure while you elevate the limb. Do not use water or rub. Royal, Barbara, 2012. The Royal Treatment: A Natural Approach to Wildly Healthy Pets.